The headline comes from News1130 and, as usual, needs clarification. But first, some background. On Saturday evening someone from News1130 and contacted me and wanted me to comment on their story. I suggested that they would do better to find someone from Translink. It appears from the on line version that they didn’t manage to get that. To be clear, Transport for London is going to run underground trains on two lines overnight Friday and Saturday nights. There will be some other lines added later. This has not been easy to achieve as the unions were critical of the impact on their members. 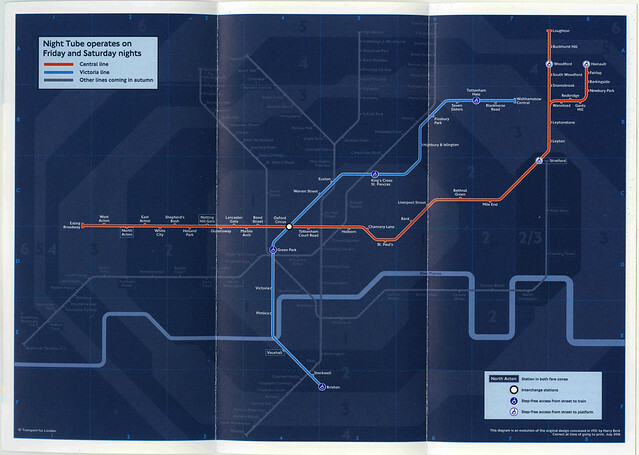 So only in London, and only a few lines: not the Overground and by no means round the clock everywhere. [Downtown Vancouver Business Improvement Association’s] Gauthier says they’ve been told there are a number of things standing in the way of 24-hour service [on SkyTrain]. I do not know what else might be in that whole list of things. But I do know that the maintenance problems on SkyTrain are not trivial. So will anyone else who has tried to use SkyTrain, as breakdowns seem to have been more of a problem recently, and there has been an admission that maintenance needed to be improved. Mr Gauthier might also recall that Translink was unable to secure a new source of funding for the rather long list of improvements that are deemed necessary to both catch up to recent increases in demand and better meet future needs, rather than rely solely on the province’s preferred method of expanding freeways. There is a shortage of resources, and even a “state of good repair” is a tall order when revenue from gas taxes is falling, due to people making better choices than driving everywhere and better fuel efficiency in vehicles. If Translink does come up with more money, I think that there are many other more deserving areas than “Millennials … having to live further and further away from the downtown core.” The fact that they continue to seek entertainment in downtown Vancouver is important to some of Mr Gauthier’s membership but is perhaps less important than some other regional issues. Possibly the decisions to increase the number of seats at licensed premises on Granville Street needed to have considered transportation impacts, and come up with some way of meeting that “need” before expansion was permitted. There are night buses, and due to the lack of traffic at night, they provide much faster and more reliable service than they can during the day. I did not see any those making more money off the later openings offering any of it to transportation providers. If Translink did extend SkyTrain service overnight it would not come free. There would need to be considerably increased security and policing – and that cost is actually higher than on systems that have to pay for additional train operators. Sadly the people who have spent a lot of time in bars tend to make more demands on police than the rest of us. If there is money available for some service expansion then I think it must go first to the most needy and worthwhile cause: HandyDART has long been underfunded and its service is nowhere near adequate. Its objective ought to be to provide a service that provides an equivalent level of mobility to people with disabilities as the rest of the population enjoys. Anything less than that is discrimination against an identifiable minority. And compared to the needs of people with restricted mobility all day and every day, the needs of the young and fit late at night on weekends pale into insignificance. The crushed rock use starts south of 33rd and continues up the hill towards 37th. The top surface is loose: in some places very loose indeed. 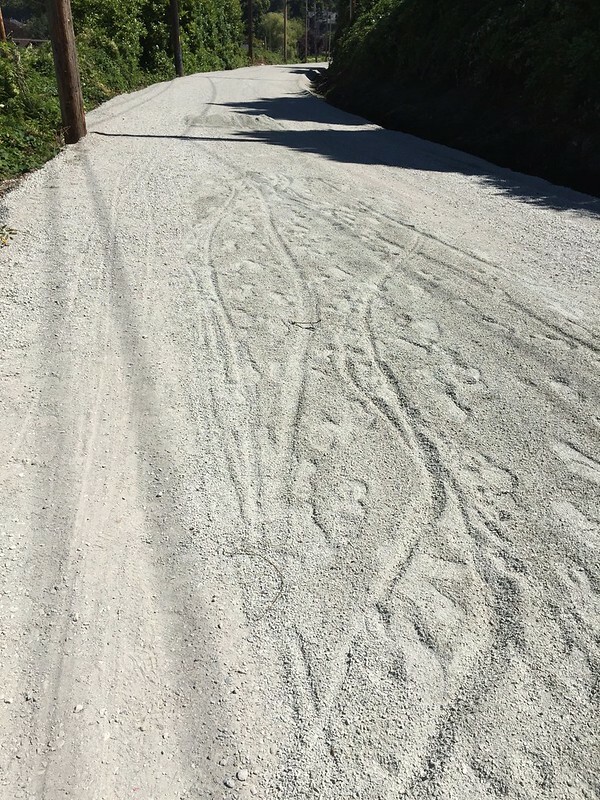 This kind of loose surface is not acceptable – especially for bicycles. I have come off my bike on loose gravel, and it was not a pleasant experience. There are some significant drop offs on the west side of the right of way here. As we were walking up the hill, a cyclist drew alongside us and continued to ride as we walked. He thought that there had been some loss of character in the greenway, as it used to be kind of wild and rugged. Maybe not everywhere needs to be entirely smooth and safe, he suggested. I have read something similar from Patrick Condon. 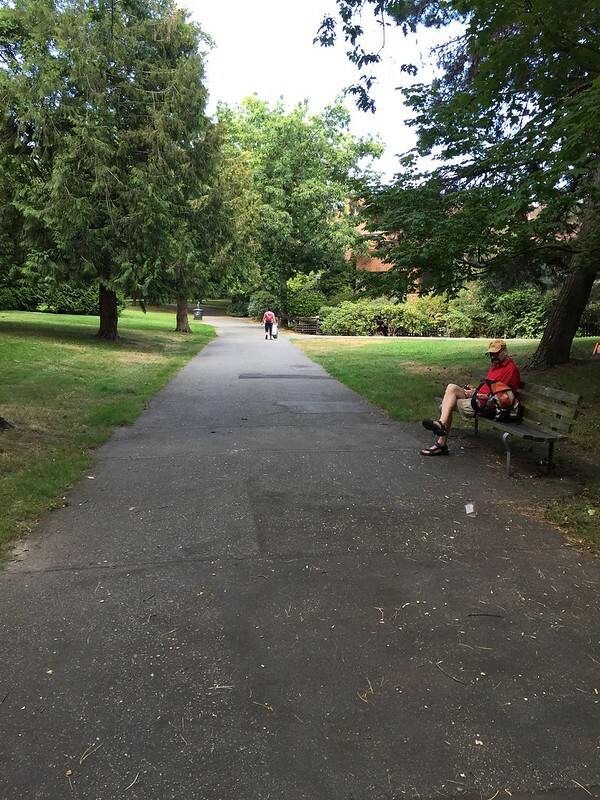 He said the path (“A little wide to be called a bike path and way too wide to be called a pedestrian path”) makes some sense from an engineering perspective. 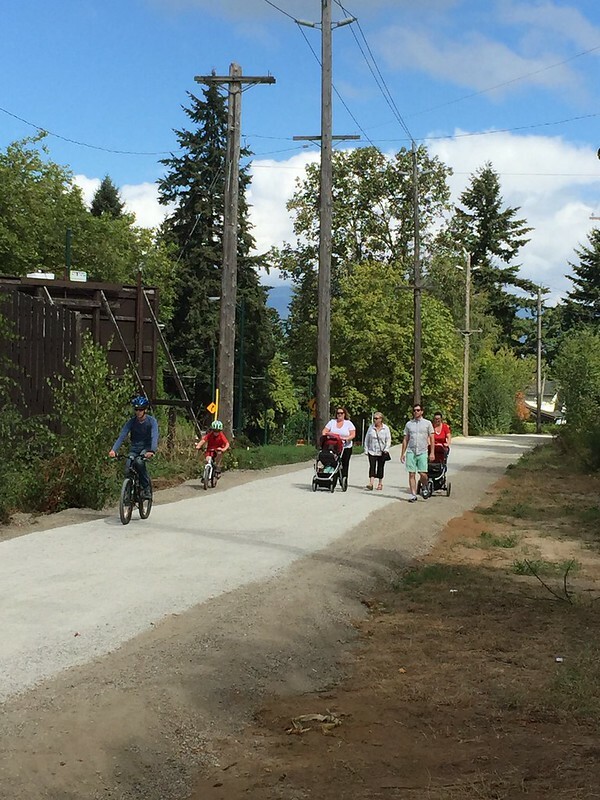 It would have been easy to plan and cheap to install — ideal for a temporary path, Condon said. Meanwhile, its foundation of crushed stone would offer drainage and stability. “I think from a political perspective, they maybe today wish they had not acted so quick,” he said. 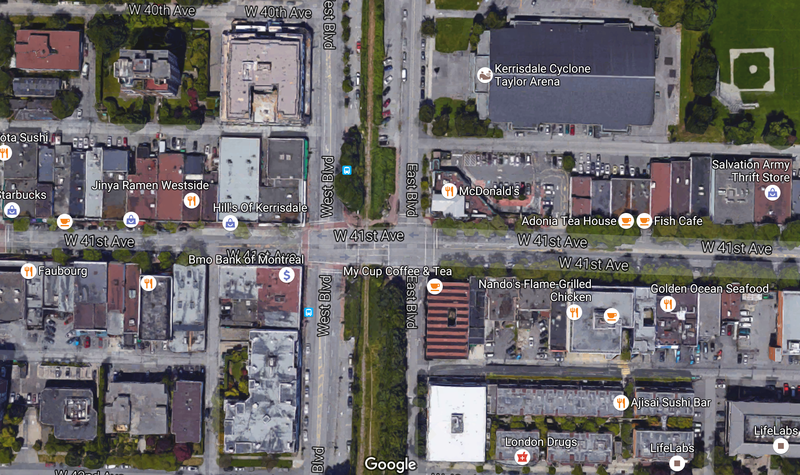 He might even be right in some places but the area between the two Boulevards in Kerrisdale is definitely not one of them. There is no reason at all why this could not be blacktopped. On each side is a road and a parking lot. In fact between the faces of the buildings this is the only bit not paved! The section up from 33rd to 37th has now got a finer, better rolled surface. None of the people in this group seemed to have any problem with the rolled gravel surface, though one lady wearing open sandals was none too pleased. You will note that the single wheeled stroller to the right of the group seemed able to cope with the coarser base on the outside of the rolled section. There is nothing scientific about this: merely talking to the people we happen to meet when walking on the Greenway. I am astonished how much information people are willing to share. I think it is an affirmation of how effective the current work has been that people actually want to stop and talk about it. I have yet to meet anyone who opposes the use of black top. And on the section between 16th and 33rd where the work has been completed, I have only heard positive comments. 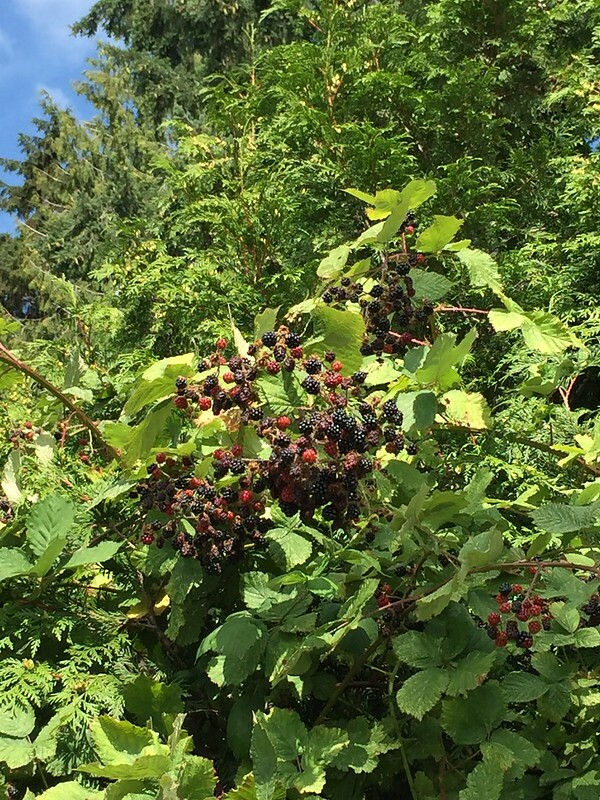 Today we met a woman who had been in charge of the work creating the BC Parkway (formerly the BCER right of way through Burnaby and New Westminster). 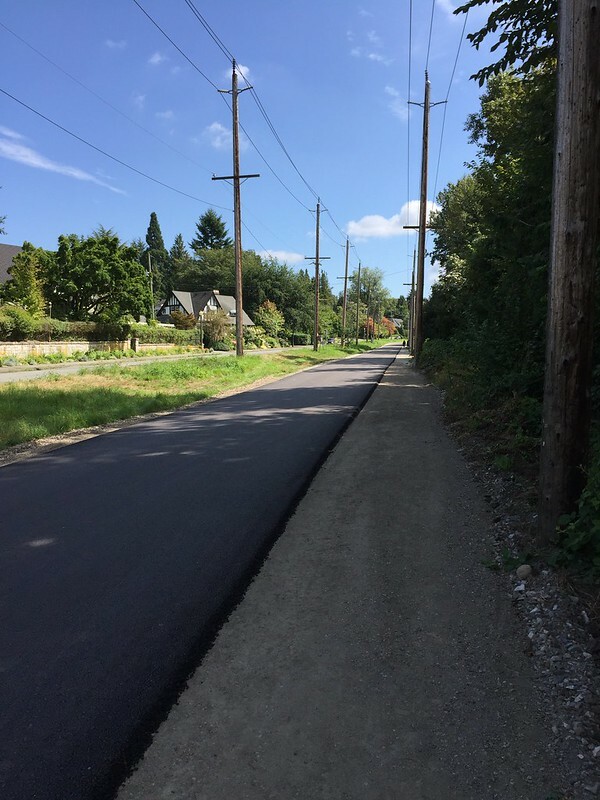 She was most impressed by what has been done north of 33rd, where we met her, but was unaware of the opposition to the use of blacktop. 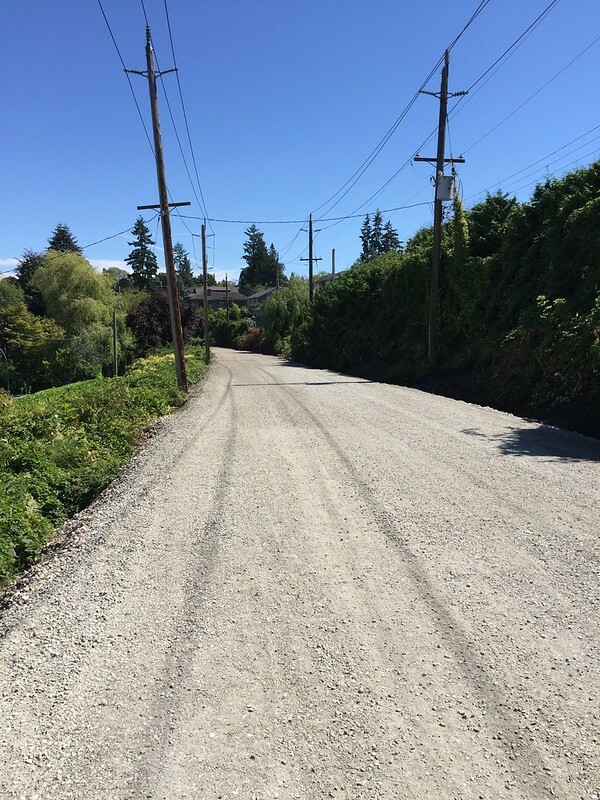 She felt that rolled gravel was far inferior, and would be the cause of greater injury to cyclists. 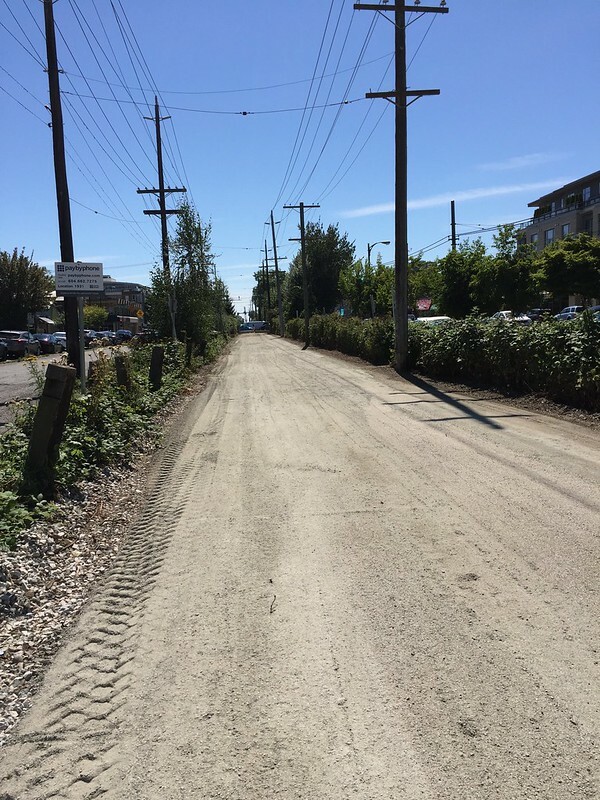 This is the unpaved surface south of the 33rd Avenue crossing: it is going to be like this all the way to South West Marine and beyond. We also discussed the politics of the decision. There are some people who feel that the priority for City funds should be affordable housing, meeting the needs of the homeless rather than a public amenity for one of the wealthiest neighbourhoods. “But this” she said, indicating the Greenway, “is going to be available to everyone. And it’s going to be a great place to teach children how to bicycle. I taught my kids to cycle in a cemetery. There’s not much traffic and they don’t drive fast there.” She was also unaware of the upcoming consultations, so I pointed her to the sign (actually now set up again but facing the wrong way) which has the URL of the city information piece. “I’m going to buy a bench for it!” She had also not heard of the use of movable tables and chairs in New York City for places like Times Square. We also met Gabriel, on his electric scooter. 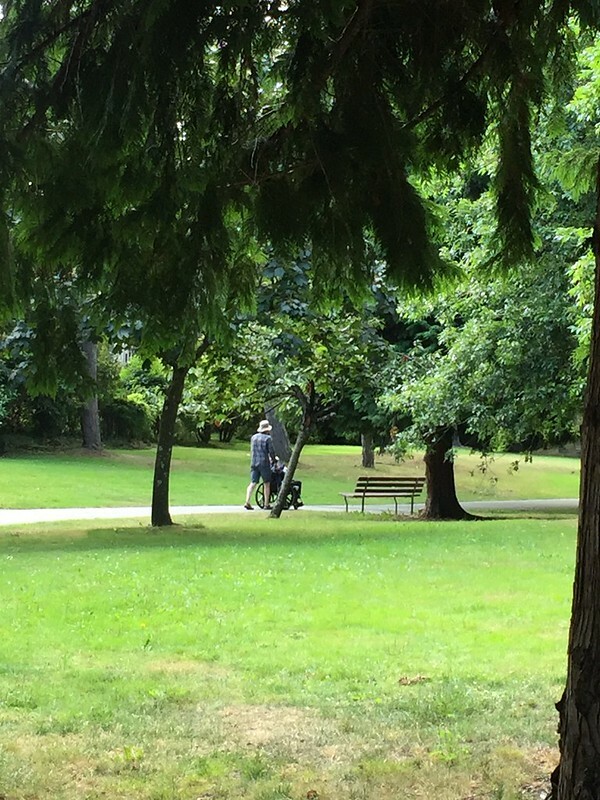 My partner wondered to me if he was in the wrong place – but I pointed out it was not a motor scooter, as it was silent! He told us that the scooter is speed limited [“no faster than 32 km/h on level ground“]. He was very pleased to see the improvement which eases his commute: he works in one of the houses along the way. We talked about the process of consultation. He was full of ideas about what could go along the greenway. Perhaps the most far sighted was his idea for a roundabout to replace the current complex double signals at 41st Ave and the Boulevards. He thought that a large enough public space in the middle would become a popular meeting place, if properly designed, and a great improvement in the urban streetscape. 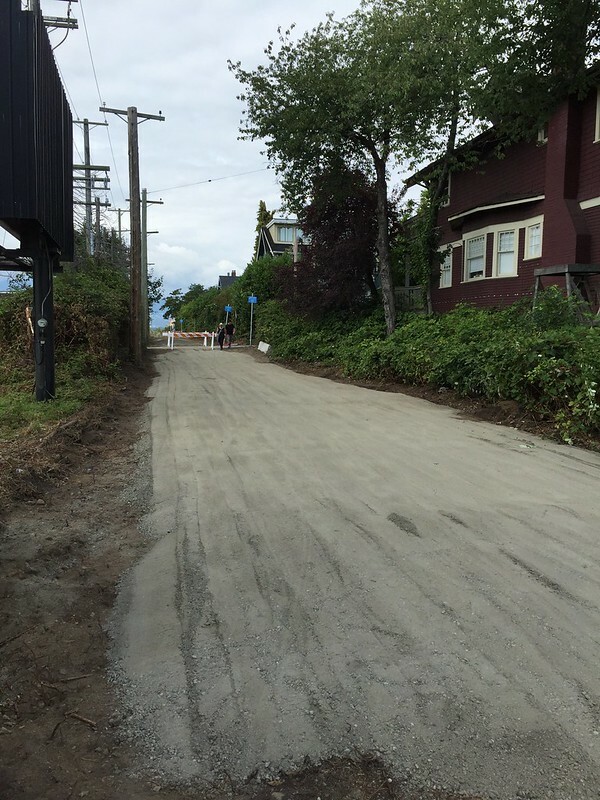 Earlier this week we met some people on bicycles, peering over the barriers at 16th Avenue where the gravel starts. They were not inclined to proceed further, and turned around to retrace their route back up to Kerrisdale. They had some fairly pointed views on those who opposed the use of blacktop. POSTSCRIPT I have just read another blog post in the form of a letter to Council on the issue from the perspective of someone who uses a wheelchair. Essential reading, I think, for a number of reasons. 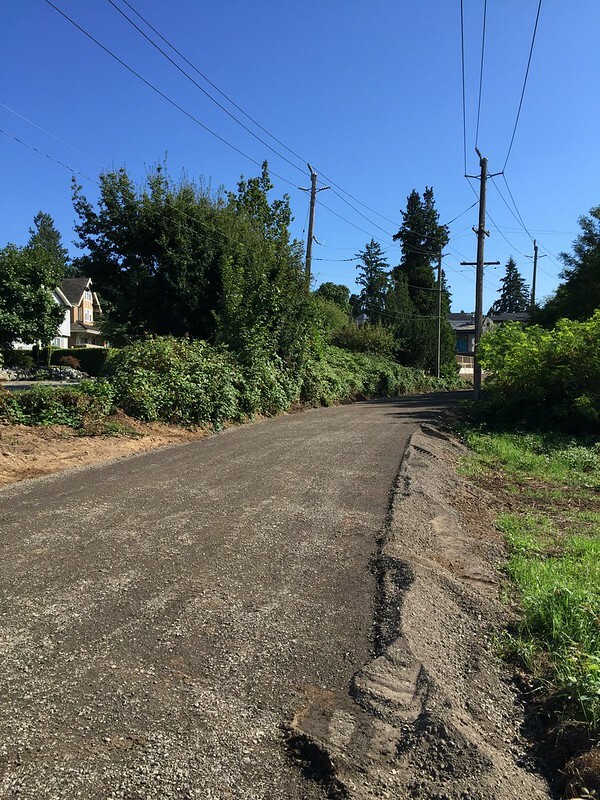 The speed with which the tracks were removed has surprised many observers along the Arbutus Corridor. It was not long before the rough ground revealed by the removal of the track ballast was being graded, and now blacktopped. Even faster was the response from the creme de la creme. 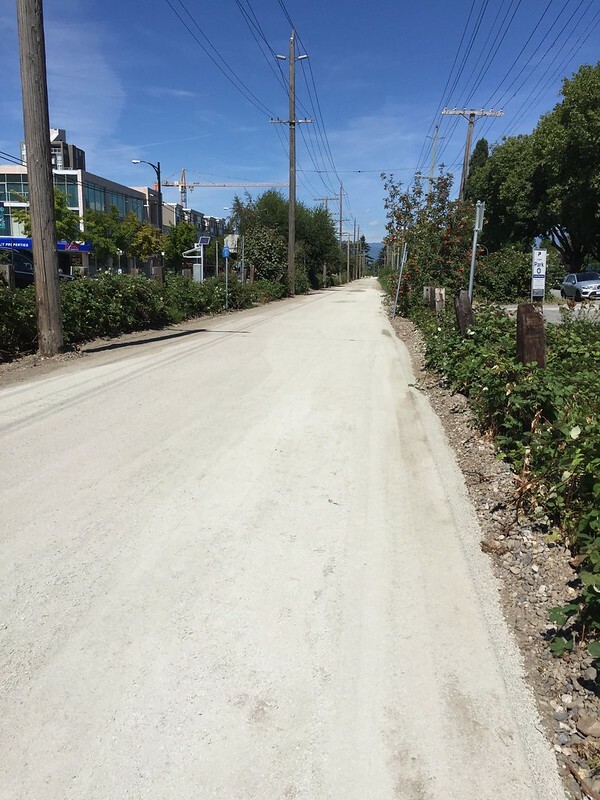 As reported by the Vancouver Courier they have been handed a short term victory, as the City Engineer appears to have conceded that not everyone is happy to see a nice new smooth surface. See also the Metro piece which links to the video made by the nay sayers. 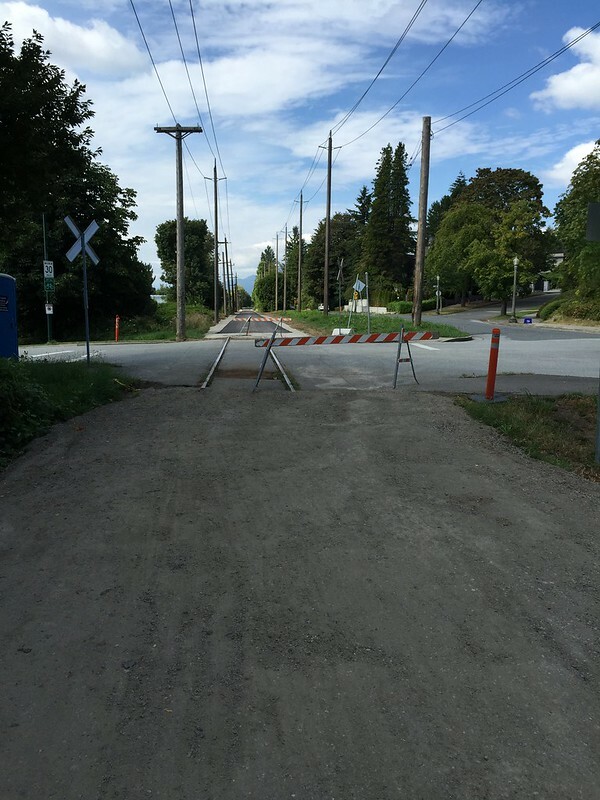 Work is still needed at the crossings both to remove the track in the roadway, finish the connections to the sidewalks and place barriers to prevent use by motor vehicles. I think the overall impact is a distinct improvement over the shabby railway, and the mess left behind after its removal (noted in my previous post). We also noted more use by people on cycles as opposed to those walking, but I think the debate needs to be refocussed away from the tiresome stereotypes applied to cyclists and pedestrians, and concentrate on the use of this revitalised space by people. All ages, types and abilities, with all sorts of interests, and not just the locals or those with a proprietary interest. I would encourage anyone to come along and share the wealth – not just those with tall boyfriends or walking sticks with curved handles. As it happens, there are plenty of good examples of pathways with multiple uses in the neighbourhood. 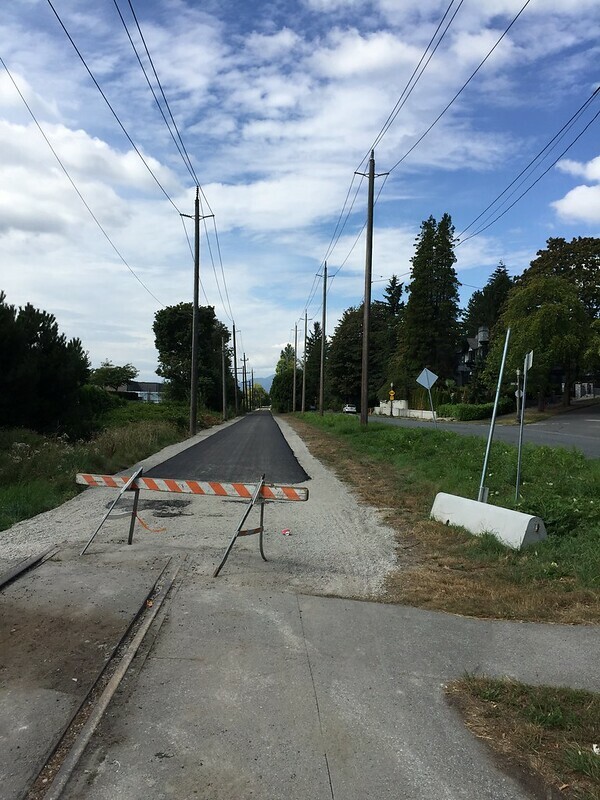 This is the scene today in Arbutus Village Park: a blacktopped path, you will note, though not quite as pristine now. There are mature trees, providing welcome shade, and benches from which to observe the passing scene. 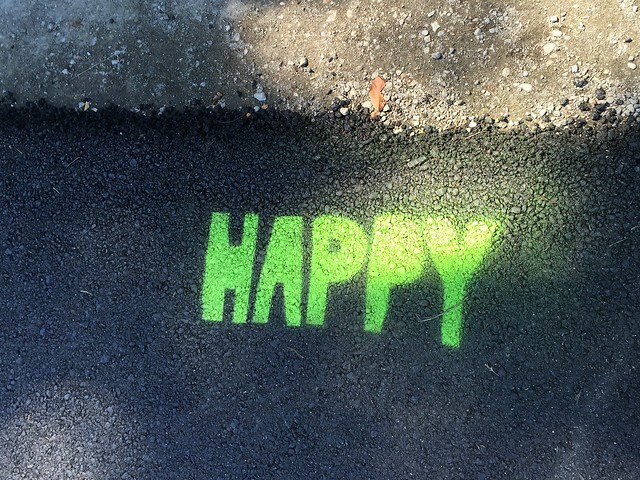 And someone who really appreciates a nice smooth pathway. 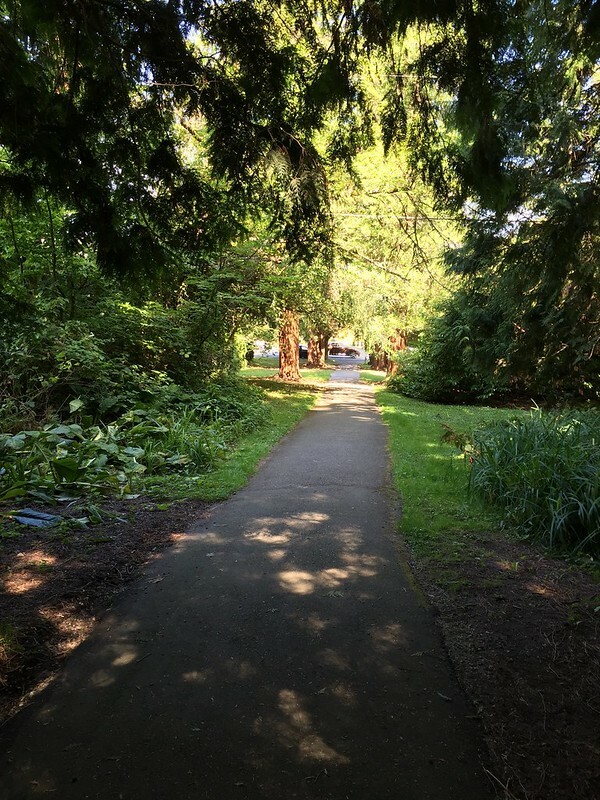 I could also point to Ravine Park which parallels the Corridor on the other side of Arbutus Street, is not permitted for use by cycles (but which seems to be unenforced) and is also blacktop through the trees.